These beautiful Christmas wreaths have been best sellers at Christmas Forest since 1976. They are the perfect size for most doors. The beauty begins with the simplicity of the wreath design. Then the elves combine abundant handfuls of pristine evergreens and pine cones into a perfect circle. The finished product is sublime. 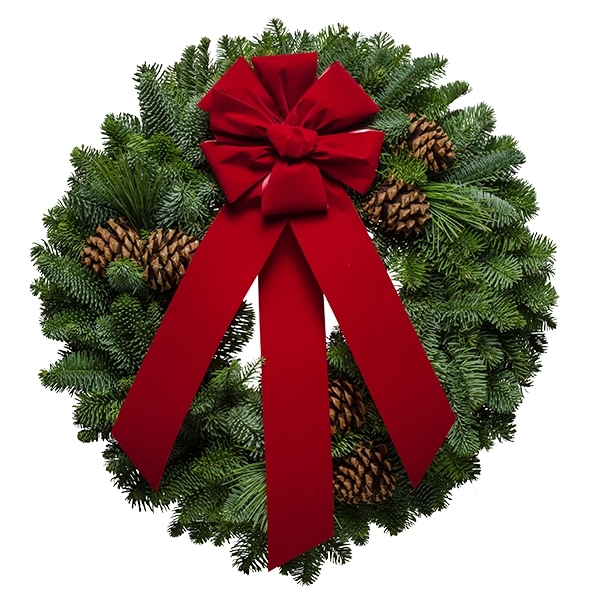 You'll be pleased with the fine craftsmanship of the exquisite fresh Christmas wreaths. This all time favorite Christmas wreath conjures up a nostalgia of past Christmases. You can almost hear the sound of a crackling fire on a cold night that you perhaps experienced as a child. Smells are so important when it comes to getting in touch with our feelings. Perhaps the wonderful aromas of these fresh wreaths will take you back to a simpler time. The rich velvety red ribbon against the deep aromatic greens of the noble fir and princess pine make this wreath a perfect fit for every Christmas season. It's a super gift for your front door. "I just wanted to let you know that the wreaths that I purchased were delivered promptly. They are gorgeous! The past 10 years I have been ordering wreaths from a different company. The price was the same but your quality far outweighs any that we have ever gotten. I want to thank you for such great service and a wonderful product. I will recommend you to all and order Christmas Forest wreaths year after year!"